The pride and tradition of the football program at the University of Southern California is unmatched. The prestige and history is one of the most legendary in the country, but since the glory days of now Seattle Seahawks head coach Pete Carroll, it has been a program that has been on somewhat of a downswing. Getting off to a 1-2 start last season, it seemed as if the Trojans were headed for another down season, but a glimmer of hope appeared when they inserted QB Sam Darnold into the stating lineup. Some players have a magnetic effect and make it seem like there is always a chance that their team can win a game, no matter the score, situation or circumstances. This was the case with Darnold. USC has a long line of successful college QBs. He seems to be the next in line of famous Trojan signal-callers. Once Darnold was placed in the lineup, the team went on to finish the season with an impressive 9-1 record. Darnold finished the season in remarkable fashion, with a 52-49 win in the Rose Bowl over Penn State. Finishing the game 33-for-53 with 453 passing yards and five touchdowns to just one interception. The final game of his redshirt-freshman campaign was the stamp on his status as a serious 2018 draft prospect. It's extremely early, but Darnold is considered the leader in the clubhouse to be the no. 1 overall pick next spring. As a football phrase, a quarterback being in a pro-style offense is still the biggest myth. There are various types of offenses within the NFL, but still no one to this day has clearly defined what exactly a "pro-style offense" actually is. At USC, Darnold is in an offense that runs similar concepts and sets that many teams use on the next level. What makes the Trojans leader seem so advanced for his age is his ability to understand when to come off of his initial read and continue through his progressions. The example above is one of numerous examples of Darnold understanding and maintaining his eye discipline. Meaning that he has the ability to successfully decipher defensive coverages and go through the progression of the particular passing concept that was called. 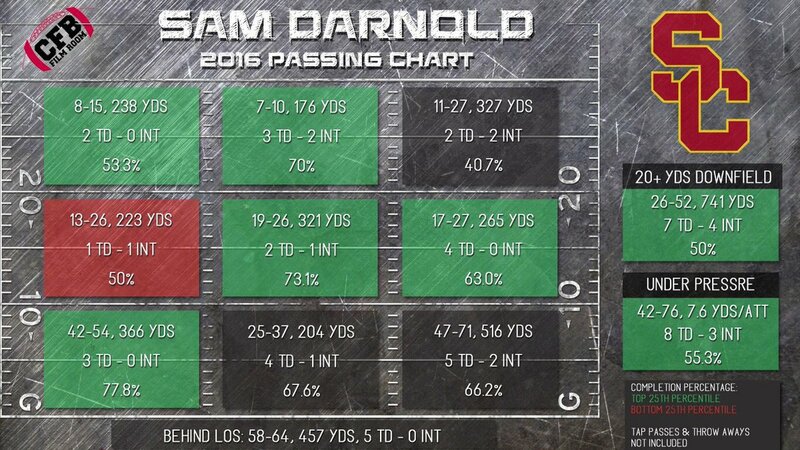 Being that Darnold is not gifted with an overly strong arm, he has to win with smarts and knowing exactly where to go with the ball. He has the vision to clearly sees things before they actually happen. Throwing a vertical route down the seam here, Darnold understands that the speed of his intended target is greater than the defender he's matched up against. Knowing that, he throws it to a spot on the field where he thinks only his receiver will be. What makes this play even better is that he holds the safety in the middle of the field with his eyes, not allowing him to steal the intended pass. It was eventful, but Darnold has only played 13 games, starting in nine. Despite the promising results he showed in 2016, there is an extremely small sample size, especially when you're referring to a quarterback. Assuming he stays healthy next season, his total will be over 20 games. As mentioned above, Darnold does not have the arm strength to consistently push the ball and attack down the field. With that, he still surprisingly finished in the top 25th percentile of QBs downfield completion percentage (50% pct.). Darnold's not asked to throw it down the field week-in and week-out, but when he's asked to, he's able to complete it at an average rate. It is probably the one aspect of his game that will be critiqued the most and that is Darnold's throwing delivery. It is undoubtedly unorthodox. Scouts have compared the motion to Jacksonville Jaguars QB Blake Bortles, as he completely brings the ball down to his hip pocket before doing an entire circular motion before the release. Many evaluators will say Darnold needs to tighten or shorten his throwing motion in the NFL, as windows close quicker and the speed of the game is faster, but to this point, I have not seen the motion effect him negatively.